Okay, so I’m coining a phrase (I think) – ambibibliophile. Definition – a person who loves and collects books no matter what format – physical, digital, audio download, etc. An ambibibliophile is capable of reading a physical book one moment and switching to a Kindle, Nook, iPad, CD player, MP3 player, or some other device the next moment. I love books. I love to read no matter what platform I’m using. There are millions of us out there, and our love of the book no matter the delivery method will survive the endless debates over physical versus digital. And no matter what, we – the consumer – wins. More books, more choices. What could be better? 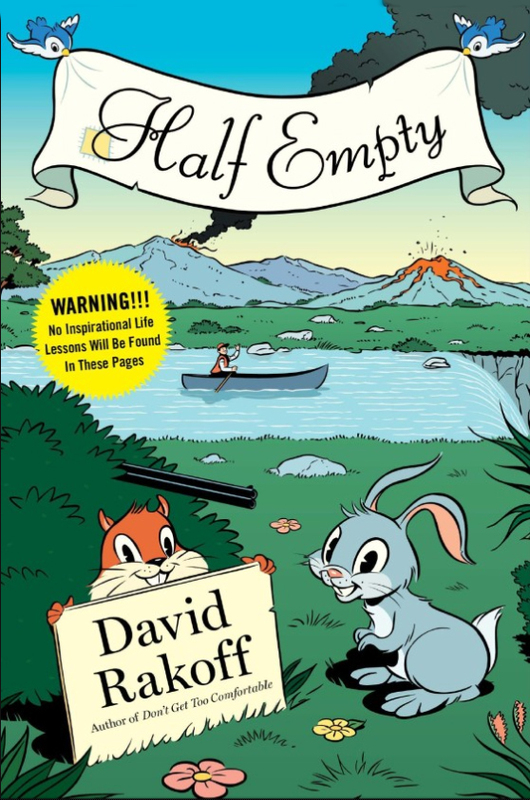 I finished HALF EMPTY by David Rakoff on my way home from Vermont this past weekend. All I can say is, Mr. Rakoff, I love your style! Okay, well, actually there is more that I can say. I plan to read Mr. Rakoff’s other books at some point in the future. I like the way he writes and what he has to say. I especially like hearing what he has to say in his own voice. Audio CDs are awesome. In some cases I think it’s the best way to read a book. HALF EMPTY is funny. I like the way the author intertwines jokes into his narratives. Very funny stuff – subtle humor, dry, categorically appropriate. Some stories that border on the sad side; some that give us a historical perspective on things (like the story about the Mormons and Disney’s Dream Home). Personal insights; personal issues; personal perspectives. Mr. Rakoff’s book has it all. The funny thing is, I can actually picture myself sitting at a table across from David Rakoff, his elbow on the table and resting his chin in his hand, looking at me and saying, “Really? You really think I’m that funny? Well, let me tell you about this time …” [voice trailing off into some rather cute tale of one of his encounters with someone or something phenomenally interesting]. I think one of the things the reader walks away with is the feeling that no matter how bad things may be at the moment, there’s always some back-story that sheds perspective on things. David Rakoff has been battling bouts of cancer for many years. And yet he still writes with a satirical and self-probing style that leads me to believe that he’s one hell of a guy who will probably get through just about anything. In the last chapter he recounts his latest cancer scare and how he was seemingly on the path to losing his left arm and shoulder. Did he hide in a corner and wail, “why me?” Well, if he did, he didn’t write about it. Instead, he tells us how he faced the situation head on and starting transitioning to having only one arm. Luckily, his body is still intact and hopefully, it will be for a long time. One thing did bother me though – David Rakoff mentions that he uses (or did use) OxyContin for pain. That stuff is dangerous! It can cause hallucinations and serious misconceptions about things that are going on. I know firsthand. Many years after having done and said some totally insane things based on perceptions of reality, I am still paying the price. My mantra regarding pain relief – DO NOT USE OXYCONTIN!! !